Would you like to have a bite to eat with family or friends? Then surprise yourself in a culinary way and opt for a delicious lunch in Apeldoorn! At Van der Valk – de Cantharel you can enjoy regional dishes fresh from the Dutch Veluwe. You can choose from a variety of delicious dishes in the à la carte restaurant. The dishes are freshly prepared from the garden of the hotel. Did you know that you can also visit the vegetable gardens yourself? For the vegetable and herb garden, Hotel Apeldoorn – de Cantharel has even received the “Veluwe Regional Products” certificate of approval. In addition to fresh products from our own garden, the restaurants work together with suppliers from the region. That means pure enjoyment of all tasty regional products while you are surrounded by the beautiful nature on the Veluwe! Always wanted to dine in a fairy-tale way? Then book a table at Huisje James, the most idyllic restaurant in the Netherlands. Tucked away in the woods, you can enjoy delicious classics with a twist in combination with fine wines. Do you want the complete experience? What could be more fun than combining this fairy-tale with an overnight stay? At Hotel Apeldoorn – de Cantharel, an overnight stay in one of the luxurious rooms or suites after dinner is arranged! With a golf cart you will be picked up at the hotel and brought to Huisje James. After dinner you will be escorted back to the hotel. Or do you choose to combine the dinner with a carriage ride? Let yourself be driven through the woods. If you pay attention, there is a chance that you will see a deer or a boar! On the way you make a stopover and you will get a snack and a drink. Upon return, you and your companions will be welcomed in ‘De Werkplaats’ for an aperitif and a glass of bubbles. Then you will be brought to your table and you can enjoy a culinary evening at the Huisje James. Always wanted to dine outdoors? 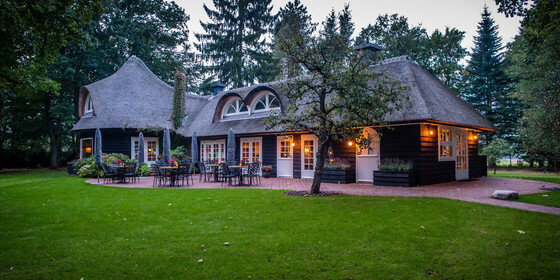 At Hotel Apeldoorn – De Cantharel, outdoor dinners are organized in the woods behind the hotel. Every season you can dine in the cosy tent with a group of at least 20 and a maximum of 28 people.